German baking, I don’t think, gets its due. It’s partially because the names of the pastries and baked goods don’t exactly roll right off most of our tongues. Kartoffel-Käse Dinnede, Zitronenbiskuitrolle, Aachener Poschweck, Schwäbischer Prasselkuchen, and, well…I’ll quit now, because it’s taking me too long to hunt down all those keys on my keyboard. And I’d rather be wrapping my tongue around German cakes and cookies, rather than trying to wrap it around their names. 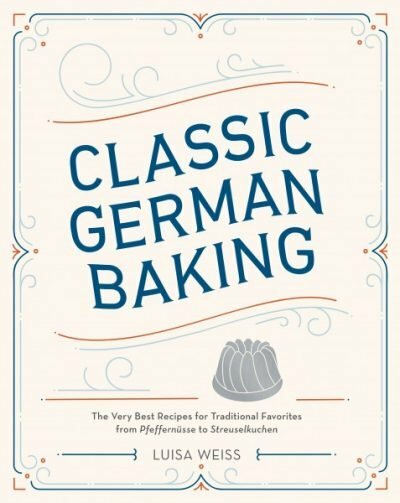 Fortunately Luisa Weiss, who writes one of my favorite blogs, Wednesday Chef, has published them in a very accessible collection of recipes, Classic German Baking. This beautifully written cookbook features traditional German favorites, adapted for kitchens everywhere. (And yes, there’s a guide at the end of the book for how to pronounce everything.) It’s one of those cookbooks that you’ll bookmark several recipes in on your first glance, like I did. Then during the next few weeks, you’ll spend your way baking through them. Luisa was born in Berlin. Her mother is Italian, and she’s lived in Germany, France, and the United States. So you’ll be happy to hear that all the cakes, cookies, tortes and kuchens are completely do-able in any kitchen, using ingredients that are easy to get. And for the few that might pose a challenge, like spiced plum butter and quark, she gives recipes on how to make them yourself. 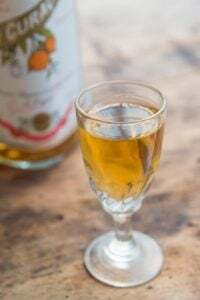 Before Luisa moved back to Germany a few years ago, in New York, she was a noted cookbook editor, so the recipes are well-written and carefully explained. I’ve bookmarked the recipe for Basler Leckerli, the Swiss cookies that take a few weeks to cure. (I made them once, not from Luisa’s recipe, and mine came out as hard as bathroom tiles.) So I’m anxious to give them another shot, and those are next on my list. I was gifted some apples by a neighbor who did some picking, and had a packet of almond paste on hand from a visit to Sicily, and put them to use in the easy to pronounce Apfel-Marzipan-Kuchen. It’s a rich almond-scented cake with loads of apple flavor, which I think is understandable to anyone. Like all apple desserts, the flavor of this custard-like cake really depends on how good the apples are. Supermarket apples are usually quite dull in flavor and bred for looks, so they remain blemish-free. Flavor is often secondary. Because we see apples all year round, it’s easy to forget that they are a seasonal fall fruit. So now is the time of year to gather some good ones, and I recommend that you hit the farmers’ market and find some heirloom or locally grown varieties, which will take this kuchen, or cake…übertrieben (over the top). 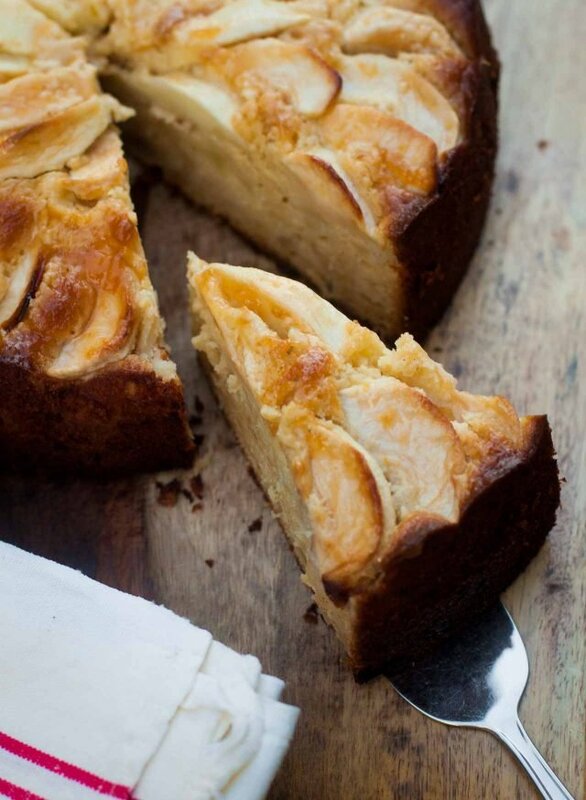 Adapted from Classic German Baking by Luisa WeissI used a mix of apples, some tart, some less-so. Do use good-quality, flavorful apples, preferably ones from a farmers' market, which taste better than supermarket varieties. For suggestions on which apples to use, ask the people at the farm stand or choose those that have a fragrance. Apples are related to roses, so often have a faint, yet lovely, rosy smell. If your apples are small, use 6 of them.Luisa recommends grating the almond paste, which I didn't do, so I had to run the mixture through a food processor. Since my almond paste was "artisanal" it wasn't as moist as what you buy at the grocery story, so that may have been the culprit. So I recommend grating the almond paste in step #4. 1. Butter a 9- to 10-inch (23cm) springform pan and line the bottom with parchment paper. 2. Peel and core the apples. Divide the lemon juice into two separate bowls. 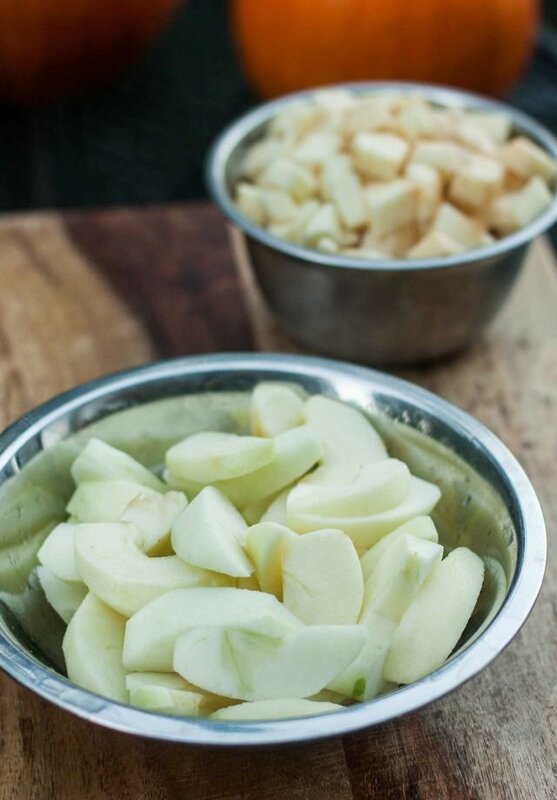 Slice two of the peeled and cored apples into 1/2-inch (1,25cm) slices, and toss the apple slices in one bowl of lemon juice. Dice the other two apples into 1/3-inch (1cm) cubes. Toss in the other bowl of lemon juice. 4. Using a grater with large holes, grate the almond paste into the bowl of a stand mixer fitted with the paddle attachment. Add the sugar and salt and mix until the almond paste is finely broken up. 5. Add the melted butter, almond extract, and lemon zest, and continue mixing until smooth. Add the eggs one at a time, stopping the mixer and scraping down the sides of the bowl after each addition. 6. Whisk together the flour, cornstarch and baking powder in a small bowl. Stir the dry ingredients into the almond batter mixture by hand, then fold in the diced apples, along with any lemon juice in the bowl. 7. Scrape the batter into the prepared pan and smooth the top. 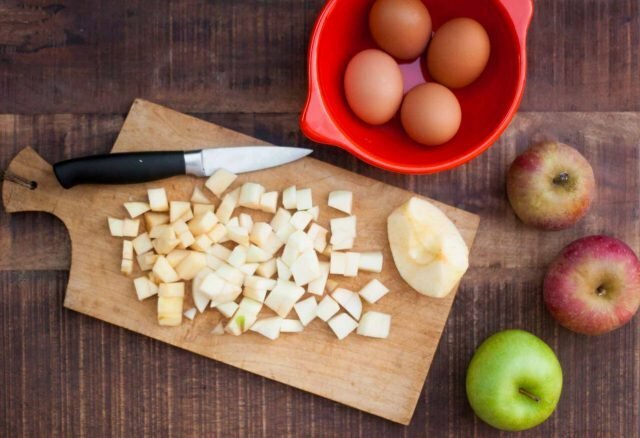 Place the sliced apples in concentric circles on top of the batter, pressing them in very lightly. 8. Bake the cake until the top is golden brown and a toothpick inserted into the center comes out clean, about 1 hour and 10 minutes. 9. Remove the cake from the oven. 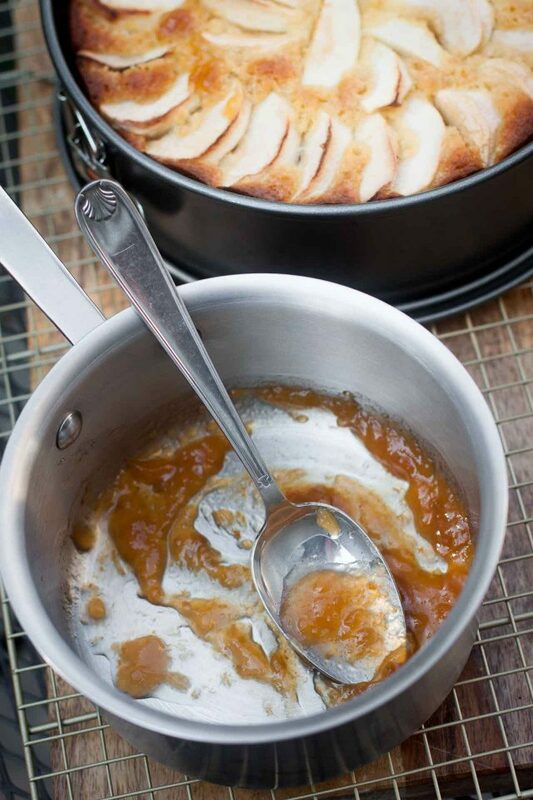 Warm the apricot jam in a small saucepan and brush it over the top while the cake is hot. Let the cake cool completely, then run a knife around the inside of the cake pan to release the cake, and remove the sides of the cake pan. Brush the top of the cake with the apricot jam. Serving and storage: This cake is so moist, it doesn't require any accompaniment. 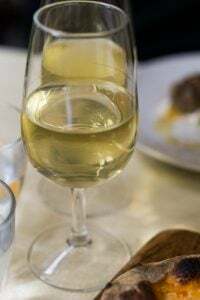 However softly whipped cream, perhaps lightly spiced with cinnamon or allspice and a bit of vanilla or Cognac, would be welcome. Cinnamon ice cream would be lovely. The cake can be kept at room temperature for 3-4 days. Avoid freezing it, which could make it soggy. Can I make my own almond paste? I've not done it but it takes a very powerful machine (food processor) to get it as finely ground as purchased almond paste. Luisa has a recipe in her book (page 264) for those who want to give it a go. In the United States, I like Love 'n Bake, but the tubes and packages of it sold in supermarkets (such as Solo or Odense brands) are generally of good quality, too. Most marzipan is meant for modeling, so has more sugar (and sometimes glucose) added, to make it more pliable. So use almond paste, not marzipan. Nigella Lawson says that almond paste in England is called marzipan. So check that link for advisements if you live in the United Kingdom. 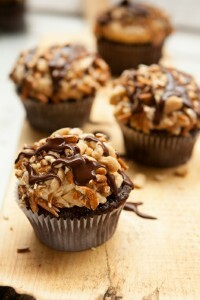 Can I make this without nuts? Unfortunately, I don't know of a nut-free substitute for almond paste. 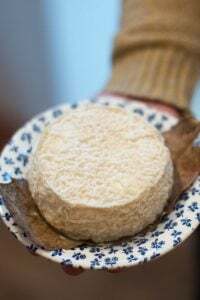 Does it matter if my almond paste is blanched or unblanched? 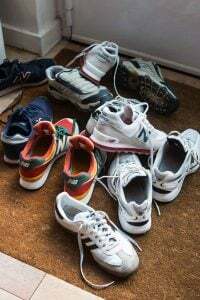 It's generally a matter of preference and what's available. Either will work in this recipe. Unblanched almond paste is darker in color, but harder to find. Is there a good way to remove this from the pan, for presenting and serving? You can run a knife or spatula underneath the kuchen to remove it from the pan bottom and lift it slightly with a spatula, then futz underneath to peel off the parchment paper and slide it onto a serving platter. (It sounds complicated, but it actually quite easy as the cake is not fragile. You can also use a glass bottom springform pan and omit the parchment paper. Looks delicious. I like pears with almonds better, so I will sub in les poires (or die Birnen). Please, let us know which pears you use and how it turns out. I have Boscs and Asian that I think should be fine as long as they’re not too ripe. Thanks. What a great idea. I wonder if a Bartlett will hold up best? Apples are abundant right now but I was thinking pears as well as I read this! I’ll have to give both a try. I can’t wait to get my hands on Luisa’s book. In the meantime I’ll have to make this. I think there could be far worse ways to wait. I loved her ‘romance’ Berlin book tremendously, meaning I actually read it from beginning to end, and yes her recipes are very much real German. The Flaumen kuchen is to die for….of course I want her new book! I received my three copies of Luisa’s book last week. It is stunningly beautiful and the recipes are great. Her blog and prior books helped me to connect with my German roots again. David, you are doing pretty good with writing all those German names. I’m sorry I am going to miss you in New York. Yes in German is ja. How very timely to read your post today! 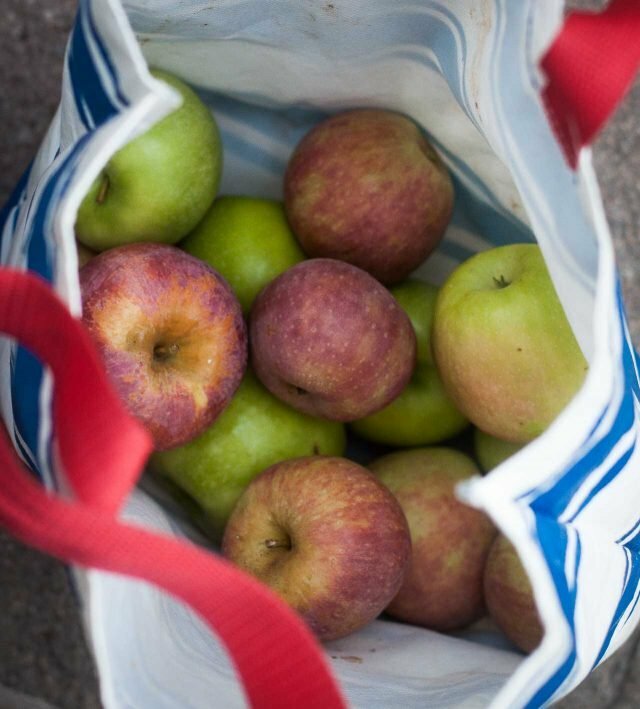 We’ve just had basketful of apples over the weekend from an old farm just outside of town! The apples this year are delicious but some blemished fallen apples need to be used for baking or compote. Normally, I would do apple crumble/pie with lots of butter, cinnamon and cardamom but once in a while it’s nice to try a new apple recipe. Thank you so much for the inspiration! I don’t have a stand mixer. Can I use a hand held mixer or my food processor. I don’t bake often but this sounds delicious and I want to make it for a good friend who is german. Yes, you could make this by hand (just be sure to get the almond paste very finely broken up and smooth) or a food processor, being sure to the final mixing of the apples and dry ingredients by hand. Just returned from Germany (and apple desserts every day). I forgot how wonderful their desserts are and was looking for a German dessert book – and here you are. I shall check out the book, make the cake and then some. I’m allergic to corn so never make recipes with cornstarch. Is there a substitution I can use in this recipe? If you just Google cornstarch substitutions, you’ll see there are several such as tapioca starch. Seeing as David would just have to do the same thing, why not look into it yourself. Not trying to sound rude but David gets so many questions that could easily be answered with a quick Google search. Did you see below — David said to substitute potato starch. Just finished the last slice of apple marzipan tart yesterday (I´m from Germany), so I´m all with you with that heavenly match of flavors. It´s really great, and for me, it´s apple season all year long anyway. And PS Yes = Ja. You could likely use potato starch as a replacement, or an equivalent amount of flour. Hi David: after reading this excellent recipe it was on my mind all week. I made it on a weeknight with some Spy apples that had an intoxicating aroma. My springform pan disappeared and I instead baked it in an ancient, high sided cast iron skillet of about the proper size. It worked a treat and the cake was demolished in no time. Thank you so much for the recipe. I’m going to have to buy Luisa’s book! Beautiful cake or breakfast coffee cake. It’s apple season here in Ca, and I’ll be making this! Meanwhile I’ll check out Louisa’s book. Thank you for the print recipe option. I know that’s new for your website and I appreciate it. Seconding appreciation of the print feature! David, townload Leo.com . It’s an app that I use frequently to translate. Dear David, Is the corn starch really necessary. I would have thought a sturdier, higher gluten flour would be better to suspend all those heavy additions. Do you think a wholewheat version of this would work? See above ^^ regarding cornstarch. You could likely use whole wheat flour although usually pastries made with it tend to be heavier. Well this is fate – I was just going to try out another ‘German Apple cake’ recipe from an American blog (even though I’m German and have many apple cake recipes from German cookbooks), but I checked your blog just to procrastinate and this came up. Your recipes are always amazing so I’m going to make this one instead now :) I think I’m also going to have to order Louisa’s book as a Christmas present for myself – I love German baking so much and any book that appreciates it gets my approval! I totally agree that it’s under appreciated – especially the amazing bread. Living on the other side of the world to Germany, baking keeps me connected to my heritage and culture, and though we have good German bakeries where I love nothing is ever quite as authentic or delicious as home baked from recipes that have been passed down with love! I am going to substitute gluten free flour for the flour. My Dad is GF and this would be perfect for Thanksgiving. Thank you for sharing this recipe. BTW, I think tapioca powder can work instead of the cornstarch. I will try and report back. How does this compare to the French Apple cake. 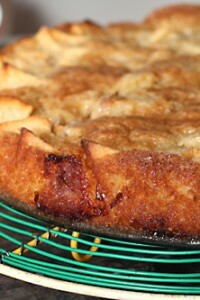 A recipe I came to through your blog and our favourite Apple desert, with the rum of course. Wow – what a delicious looking cake ! It reminds me of an apple cake we enjoyed when I was growing up. My mom was from Germany and was a fabulous cook and baker. A German apple cake was one of her specialties. It was also one of the first things I learned to bake. Although we had an electric hand mixer, I remember my mom always insisted that I cream the butter and sugar by hand as she felt that was the proper way to do it. It was quite the arm workout ! I look forward to trying this recipe and checking out Luisa’s book. P.S. I love your blog David. It’s such a joy to read and I love your sense of humor ! The podcast Planet Money recently did a piece on why apples became so tasteless. But there’s hope! I bet a shot of Calvados would be good here. A little Franco-German detente. Oh, my! That cake looks delicious – and pant at the thought of almond paste (or marzipan) among the ingredients. The cookbook goes right on my wish list, especially remembering the pastries at a German pastry shop near our place in NYC. Such good pastries and breads! OH yes! My first bakeries were the German ones in the East 80’s of Manhattan- filled with little sculpted marzipan figures and linzer tortes! Katrina, would you mind telling me the name of your German bakery? I live in NYC and am pining for bienenstichkuchen, brezen, mandelhoernchen, and krapfen. I’m assuming that it’s probably better to slice the two apples into more than 8 slices each, as 16 slices won’t be sufficient to cover the cake, and they’ll likely be too thick. Do you think this would work with a high quality gluten free 1 to 1 flour substituted for the regular flour? Oh dear, I have no experience with GF flour, but I think it’s worth trying out! Do let me know how it works out! I think I just found my Christmas present:). I’m heading off to Berlin in a couple of weeks so look forward to German baking in situ. It’s been way too long. Last time I was there the patisserie at KaDeWe was easily as good as anything I’ve tried in Paris. Wow this looks really good. I am so impressed, I love cakes like this. Thanks for all of the information David, I love all of the details about this. Beware and read the Nigella link. 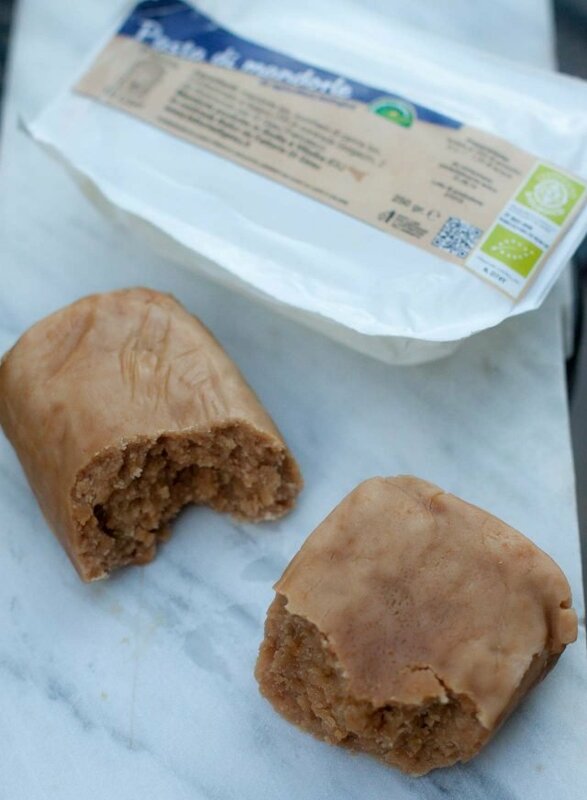 I suspect her team would advocate home made paste for this recipe 50:50 ground almonds: caster sugar , not the 75% sugar marzipan which rolls out very well. This cake looks great. Do you think I can substitute almond butter for the almond paste and some of the butter? I made lots of almond butter in my food processor the other day. It would be great if I can use that instead of buying almond paste. Almond butter and almond paste are totally different things – almond butter is made of ground raw almonds processed until creamy and smooth. Almond paste are blanched almonds processed with sugar (and sometimes flavorings) until smooth and kneadable. One cannot be used in place of the other. Hi Luisa. Is the almond paste in your recipe the Marzipan that is on supermarket shelves in Germany, or should I look for Mandel-Paste? Also should I use Type 405 or 550 flour? I am still working out US-German baking ingredient equivalencies. Thanks! Use 405 flour. Buy Marzipanrohmasse. Thanks! I have been looking at marzipan packages in various stores trying to understand the differences (with my limited German). Now I can finally use some of our big stash of apples in a new way! This cake looks so moist and delicious! Making your own almond paste is very easy and can be done with a simple food processor. It does not come out as super-fine as store bought, but you can control the sugar quantity and it is much less expensive when making it at home. Dear David, thank you always for your sharing good recipes. I like your blog as well as your books. I just made this German apple cake today. It tastes really very very good. Thank you again. Have a nice day. I made this cake last night and I couldn’t be more in love with it. For the first time, my cake looks like the one in someone else’s photo. I had two slices last night and it’ll probably be my breakfast today. Wow, definitely needs this cookbook. Looks/sounds amazing. Wondering if this could be adapted into small cakes or even bars? Any easy to serve version for a crowd… Or does it slice a little messy? Semplicemente fantastica! L’ho preparata ieri pomeriggio ed ha avuto un gran successo. Grazie David! Come sempre, post e ricetta imperdibili!!! David, I love your blog and your pictures. I am thinking of baking this recipe divided into two loaf pans that are lined with parchment. Foolish? Nope! I think that would work just fine. You’ll likely need to reduce the baking time, to compensate for the smaller pan, but I can’t say how much without testing it out. So just keep an eye on them. This is a very timely post — I was just wondering what to do with a large bowl of beautiful macintoshes. I made it today and it is phenomenal! For the record, 3.5 oz very old, dry marzipan, grated to a fine powder and mixed with 3.5 oz almond butter seems to be an acceptable substitute for the almond paste (sometimes you gotta use what you have). 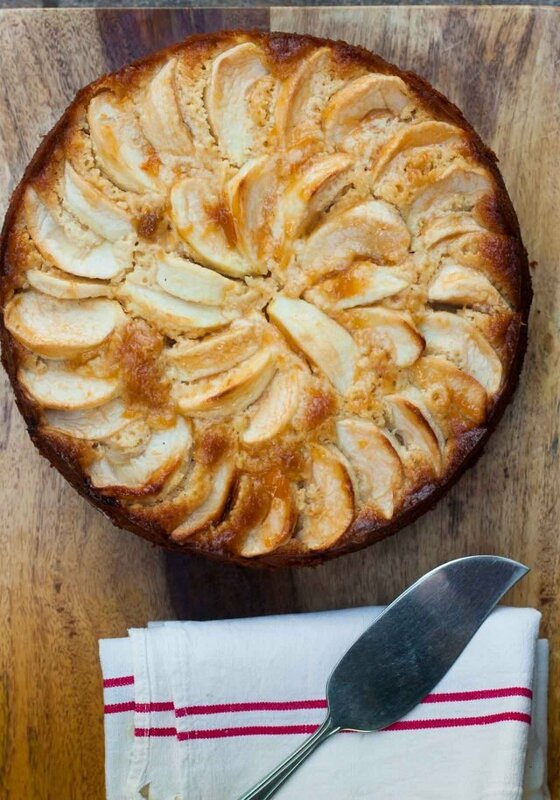 How similar is this recipe to a Dutch appeltaart? My husband saw this recipe and asked me to make the cake for our dinner party last evening. It was a huge hit and the star of the party. This afternoon we are going to make the pumpkin jam. Thank you David, you never disappoint! I’m baking this cake right now, it’s weird to use so much cornstarch in a batter but wow, does it smell and look delicious! Love your blog! Thank you! My almond paste was too soft to grate, so I used my pastry cutter to mix it with the sugar. That worked pretty well. And the finished cake was delicious! I made this for a gathering of friends Saturday night, followed the recipe almost to the letter except I was out of almond extract. It was still delicious. 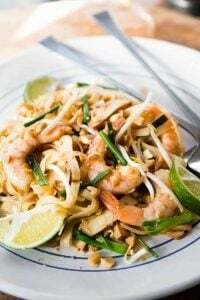 Guests raved – I will make this again. Evening or afternoon cake – lovely. I made this the other day, and it is delicious. However, it took an hour and 50 minutes to cook – it was still SO raw at 70 minutes. Do you think it is because I set the pan on a jelly roll pan (I fear leaks from the spring form), or should I check my oven temperature again? Pound cakes also tend to take forever in the oven. I always keep an oven thermometer in my oven, and mine baked at the time noted in the recipe. If yours took that much longer, it sounds like you should check the temperature of your oven with a thermometer to make sure it’s correct. Thanks – I’ve done it in the past and not found issues, but…. then I doubt the thermometer! I’ll check again. I made this cake on Sunday. It is beautiful and delicious, and has definitely earned a spot on my Thanksgiving menu. I may serve it with the option of a chocolate port sauce on the side. Thanks for the recipe!!! I had leftover port syrup from poaching pears in port. I did not have apricot jam. I used the syrup to glaze it. Delicious. I’ve been serving it with ice cream (the philly style vanilla from the perfect scoop) with a bit of port splashed in just before freezing. This looks great and sounds like the cake my Swiss grandmother made. Could you please post a recipe for Swiss plum tart? My father talked about the one his mother made all the time. She never measured the ingredients. It had sliced plums and a sour cream topping. It was probably a Swiss-German recipe. Thanks! 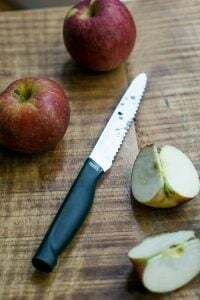 I was very excited to try this recipe, as I love apples, and I found some beautiful Bramleys at my local farmers market. It is a delicious cake, but I was a bit disappointed that the almond flavor seems to dominate it and I could hardly taste the apple as a result. I did follow the recipe, so I’m not sure if my results were unique. But next time, I think I’ll reduce the almond extract to 1/2 t.
I (an American living in Berlin) was also very excited to try this out. I searched for Mandelpaste online but couldn’t find it, so I used marzipan (200g, Penny brand) instead. Consistency was very soft, so I broke it up into pieces instead of grating it, and it eventually mixed into the wet ingredients. Reduced my sugar to 50g. Result: fabulous. Even my German friends raved about it and they’re not easy to please. Thank you Luisa and David for this recipe and I hope you are enjoying your NYC event tonight! I’m planning on giving this wonderful-looking cookbook for a gift this Christmas, but not before I get a preview of it first! David: I grew up near Basel so the Leckerli were always part of Christmas festivities. And you can’t really buy them outside of Switzerland so I started making my own when I moved away. I have not seen Luisa’s recipe, but the one I use works really well. What is important is kneading the melted honey and sugar into the dough while it is still quite hot – makes it easier to work with. The second thing is to roll the dough, put it on the baking sheet and leave it to dry out overnight. Then bake it the next morning. That somehow makes the leavening work better and does not lead to rock hard cookies. They taste good right away but get better if you put them in an airtight container for a while. This makes a light, airy cake that’s not too sweet. At 1:10, mine came out well browned — next time, I’d start checking it at the 1 hour mark, or maybe a little earlier. I passed the warm apricot jam through a sieve and added 1/2 Tbsp of brandy to thin it. Would definitely make again. Might buy the book, too. I made this today. The recipe is easy to follow, and the cake tastes and looks great. It was perfectly done at 1 hour, 10 minutes. The flavors transported me back to my student days in Germany. Thanks, Luisa and David, for a great recipe. The book is on my Christmas list. This recipe is awesome. I’ve already made it twice! We are working our way through a giant bag of apples so this was just the thing. The first time I made the recipe as written. It was delicious but I found grating the almond paste to be tedious. I remembered a JoAnne Weir almond cake recipe where she makes the whole thing in the cuisinart. So the second time I made the cake in the cuisinart up to when you fold in the apples. I have to say the texture of the cake was very smooth and creamy and it was much easier to make. 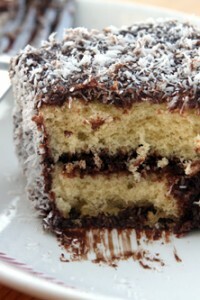 This looks delicious and has made my to bake soon list! Thanks for sharing! I am looking forward to making this cake at the end of this month. It looks so delicious. One question I have – do you have a substitute if I don’t have apricot jam? Thanks. Instead of apricot glaze, I made an apple cider caramel to drizzle on top. Still waiting for it to cool. 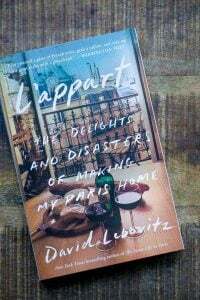 Wish I could cook with you in Paris David!